Please note: This survey was administered on Lewisham's old consultation portal which is no longer in use. It is being replicated here to allow the results of the consultation to be shared with residents. Following requests from local residents and businesses in your area, Lewisham Council carried out a consultation in May 2018 to find out if there is a need or support for a new CPZ in your area. Thank you to all residents and businesses that responded to this consultation. 1. Progress the ‘Ladywell West’ area as outlined in this document to statutory consultation with view to implementing a new 2-hour CPZ operative Monday to Friday between the hours of 10am and 12pm (midday). 2. Do not progress the ‘Ladywell South’ area to statutory consultation as outlined in this document. This defined consultation area does not meet Lewisham Council’s policy criteria, and support for a CPZ is not focussed in one confined area. Partial implementation of a CPZ in this location is likely to result in substantial displacement of parked vehicles into neighbouring roads. 3. Do not progress the ‘Brockley’ area to statutory consultation as outlined in this document. This defined consultation area does not meet Lewisham Council’s policy criteria, since there is very little support for a CPZ in this area. Following requests we have had from local residents and businesses about parking in Ladywell, Lewisham Council are consulting to see if there is a need to implement a controlled parking zone in the area. Please note: This survey was administered on Lewisham's old consultation portal which is no longer in use. It is being replicated here to allow the results to be shared with residents. 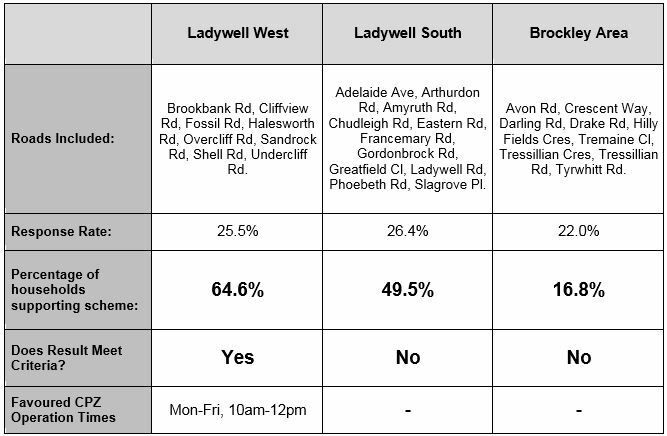 The responses to this consultation will determine whether or not a Controlled Parking Zone will be implemented in Ladywell Officers will progress the Controlled Parking Zone to implementation should the consultation receive at least a 10% response rate with more than 50% of responses in favour of the proposal.